Should you wear high heels? I’m sure every girl has experienced the excruciating pain that comes from wearing heels. Most of us have a love hate relationship with them. I often can’t wait to put on those new heels that I just bought. But by the end of the night my feet are in pain. Can high heels actually be dangerous to your health? Wearing high heels can actually damage your bones. My grandma has two bunions on her feet and the doctor told her that it might be due to wearing high heels. When she showed me the bunions I was appalled but the sight of the huge bumps on the sides of her feet. A bunion occurs when your big toe is pushed up against the surrounding toe causing the joint of your big toe to stick out. My grandma constantly wore high heels when she worked during her adulthood. She especially loved wearing those really pointy high heels that just look extremely painful for all your toes to be crammed into that tight space. This doesn’t go to say that wearing high heels will cause bunions to develop. But there does seem like there is a correlation between wearing high heels and bunions developing. In addition, wearing high heels can also affect your posture. Girls usually have to find their balance when wearing high heels which causes them to push their chest forward. This causes the whole spine to come out of alignment. There is an excess of pressure put on your knees and the balls of your feet. In a study done by an Australian scientist he chose an experimental group that wore high heels for at least 40 hours a week for many years of their lives. This could be considered a longitudinal study. The control group consisted of women who rarely or never wore high heels. The scientist kept the age of the women around the same range and chose middle aged women into their 20’s or 30’s. He discovered that women in the two groups walked very differently. Women who wore heels took short quick strides that really took a tole on your leg muscles. He discovered that people who wore heels strained their calves and can increase strain injuries in the future. Although there are many dangers to wearing heels, every girl comes to a point where they must wear them. Doctors of osteopathic medicine point out that there are stretches you can do to prevent these problems. Also wearing heels for a short period of time and shorter height won’t do as much damage. This entry was posted in Uncategorized on September 15, 2016 by Melissa Lee. Who doesn’t love a cute new pair of shoes, am I right ladies? Especially heels. Ive always loved wearing heels for as long as i can remember, even when i was play dress up at a young age. When I was little I used to love put on my moms heels and trying to walk around in them. I think that over the years I have gotten walking in heels down to a tee. But I do know that being comfortable is very important! I once went to a formal and wore these brand new pair of beige heels, which was a bad decision on my part. Let’s just say that by the end of the night my calves were shaking so much that I couldn’t stand up anymore and I was miserable. I never knew how much wearing heels could affect you! Someone better tell North West to read this blog! 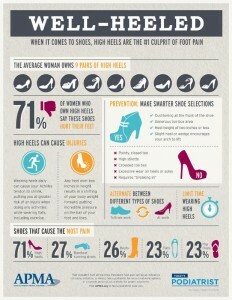 I understand how high heels could cause heath problems as they as so uncomfortable and unnatural. An article written for women health magazine states that heels can also cause damage to your ankles by stiffening your Achilles Tendons and cause spider veins. I attached the link to the article, I talks about all of the damages wearing heels has on the body. I don’t get how you even walk in high heels. When you walk normally, you have a natural heel-to-toe movement with your foot. Place foot down with heel, shift weight to toe, and step to next foot. Repeat the process. With high heels, I don;t see how you’d be able to do that. You’d just place your foot down flat, heel and toe at the same time, and then pick the other one up, move it forward and place it down. That sounds really slow and awkward. Is the fluidity of walking that I mentioned previously undercut by how you have to step with high heels? So where does that “love” part come in from that “love-hate” relationship. Cuz right now hate is up 2-0. Honestly, it does not surprise me that heels can seriously damage your feet. After a night out in heels, sometimes my feet hurt more than they did after standing for hours upon hours at THON last year. I love the way that I look in heels, I wish that companies just focused more on the comfort aspect of them rather than the style aspect of them. I was surprised to discover that heels can worsen your posture. After reading this article, I’m definitely going to stay away from heels whenever I can! Here’s a funny video of women tripping and stumbling in heels that are just a little too high for them. I LOVE SHOES! Over my many years of shoe shopping, I have learned that if the high heels are not comfortable for the five minutes of trying them on in the shoe department, do not buy them. The shoes will be impossible to wear for more than an hour or so in normal life. I wore a pair of heeled boots out one evening for about three hours, and the balls of my feet were hurt for the next two weeks. I had to resort to walking on the sides of my feet or not at all. I wonder why companies do not make more comfort-style high heels? Do you know the optimal heel height to reduce damage? I am typing this comment while sitting in front of a sign on my wall that says, “Keep Calm and Buy Shoes”, so immediately I felt like I had to read your blog post. You mentioned how bunions may be the result of women wearing high heels, specifically pointy ones. I myself already have bunions and I have not had a job where I needed to wear high heels as a part of my uniform. I was in dance classes from the time I could walk and obviously had to wear the proper footwear for each style of dance. Due to the long hours I spent wearing specific dance shoes, my feet began to recognize the tight small area where my toes were kept and thus gave me bunions. My bunions are not that bad yet but I can predict that they will become worse over the years when my job requires me to wear high heels. I will definitely try out some of the stretches and precautionary measures to try and stop my bunions from worsening. I definitely understand how this can affect you feet and alignment. Every time I take my heels off from the night out I feel sore for a couple of hours. It sometimes makes me wonder if I’m actually doing a lot of harm! Really interesting read. I clicked on this actually hoping to find out that high heels are extremely bad for your feet so that I would have an excuse not to wear them. I too have a love/hate relationship with them although I would rather prefer not wearing them at all. Researching led me to find that there might actually be a correlation between wearing heels and lower back pain http://www.lowerbackpain-help.com/high_heels_cause_back_pain.html. Although there is no causation, wearing heels can contribute to lower back pain.